Videos from the evening performances of recent if p then q book launches held at The Hardy Tree Gallery in Kings Cross – Nathan Walker (Action Score Generator), Chrissy Williams (Epigraphs), Stephen Emmerson (Stephen Emmerson’s Poetry Wholes and Family Portraits forthcoming) & seekers of lice (Encyclops.). Thanks to Steven Fowler for helping arrange this and for filming. Peter Jaeger’s 3 hour performance of A Field Guide to Lost Things to follow tomorrow. if p then q is an experimental poetry press which has been publishing cutting edge work since 2008. This event is a chance to both launch the latest crop of if p then q titles and celebrate the final night of Steven Fowler’s Mahu exhibition at The Hardy Tree Gallery. As well as performances by Nathan Walker, Chrissy Williams, Stephen Emmerson and seekers of lice, the event will feature a special, not to be missed, 3 hour performance by Peter Jaeger (watch the whole thing or drop in and out), as well as a collaborative art workshop with artist and director of The Hardy Tree, Amelie Russell. The event is free and there will be a bookstall selling all if p then q titles, including the recent landmark Written 1976-2013 by P. Inman. Should you wish to this is a bring your own booze event. Chrissy Williams is a poet, editor and tutor living in London. She is director of the Free Verse: Poetry Book Fair and a Visiting Lecturer at the University of Hertfordshire. She is currently editing a book on Poetry Comics for Sidekick Books. Her if p then q publication, Epigraphs, has been praised highly by a number of reviewers – Sarah Gonnet, Emma Lee, Dead Ink, Stride and Shearsman. The book was also featured on BBC Radio 3’s The Verb. Stephen Emmerson’s books and objects include: Telegraphic Transcriptions, a never ending poem…, Comfortable Knives and Pharmacopoetics. He co edits Blart Books with Lucy Harvest Clarke.https://stephenemmerson.wordpress.com/ He has two if p then q publications – the very limited Stephen Emmerson’s Poetry Wholes and the upcoming publication Family Portraits. seekers of lice is an artist and writer, with 10 books in the Tate’s collection of Artists’ Books. Other books include Theatre Of Objects (VerySmallKitchen 2012) and limber (The Knives, Forks and Spoons Press). Fly-Leaf is included in VLAK 5 (2015). Her if p then q collection, Encyclops., is a print version of an artwork which was displayed at News of the World gallery in London. Peter Jaeger is a Canadian text-based artist, poet, and literary critic now living in London. He is the author of eleven books, and his most recent publications include John Cage and Buddhist Ecopoetics (Bloomsbury 2013), 540493390 (Veer Press 2014). He has also shown bookworks and performed his work at various galleries and art festivals, including MACBA in Barcelona, the Whitechapel Gallery and the ICA in London, the Arnolfini Gallery in Bristol, and in Turkey at the 12th Istanbul International Biennial of Contemporary Art. He is Professor of Poetics at Roehampton University in London. His if p then q title, A Field Guide to Lost Things, is a novel which recomposes elements of the first three volumes of Marcel Proust’s Swann’s Way. Nathan Walker is an artist, curator and writer. His work investigates writing and speaking in and as performance. Primarily working in the fields of performance and action art, Nathan’s works explores expanded concepts of writing, including durational writing and sound poetry. His work also extends into online projects that consider the event of performance in electronic poetry. Alongside artist Victoria Gray he is co-director of Oui Performance an artist-led organisation dedicated to research and presentation of performance art. nathan-walker.co.uk. His if p then q title, Action Score Generator, is a print-based version of his fantastic website of the same name. Mahu is SJ Fowler’s first solo exhibition in London. A novel onto gallery walls. A novel written without prelude or revision. A novel written in black ink on white walls. A novel in words that veers into neologisms. A novel in language that veers into abstract symbols. An asemic novel. A novel of twenty-one days, before it is stripped, chopped, framed, never to be reunited again. 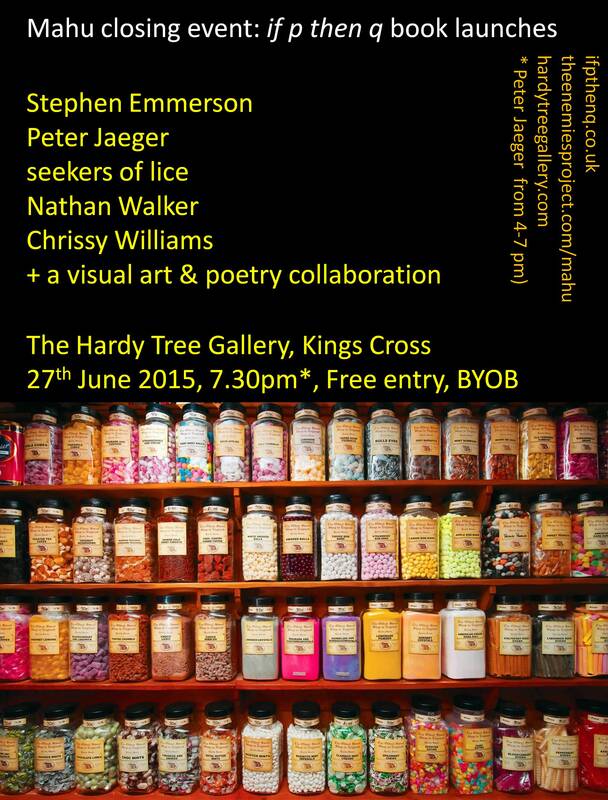 Live literature night Verbose is back on Monday 22 June. This month, our special guests are James Davies, Tom Jenks and Scott Thurston, the three organisers of long-running, Manchester-based experimental poetry reading series The Other Room. No slouches on the publishing front, with over 20 books between them, James, Tom and Scott also collaborate extensively with other writers and run various other enterprises: if p then q independent publishing house (James), zimZalla avant objects (Tom) and Journal of British and Irish Innovative Poetry (Scott). There will also be an open mic of prose and poetry – visit the Verbose website for instructions on how to sign up. Your host is Sarah-Clare Conlon. It’s free entry and doors are at 7.30pm – get there then to bagsie a seat. Verbose takes place every fourth Monday of the month at Fallow café, 2a Landcross Road, Fallowfield, M14 6NA. See http://verbosemcr.wordpress.com/ for more details.